Jadon Sancho’s recent twitter activity has hinted at a potential move to Manchester United. The youngster has been heavily impressive for Borussia Dortmund, with his performances attracting interest from multiple European powerhouses, Manchester United included. Several sources have dubbed the Red Devils as the frontrunners in the race for the England international’s signature. And now, Sancho’s activity on social networking website Twitter might just strengthen this claim. 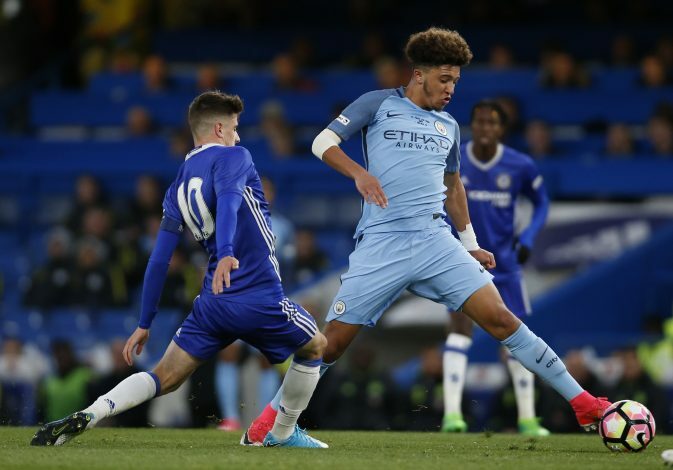 The former Manchester City starlet was seen retweeting a post shared by Goal, which was captioned: “Ferdinand would love to see Sancho in a Man Utd shirt”. The retweet has since been removed. The article by Goal consists of former Manchester United defender and current BT Sport pundit Rio Ferdinand’s take on Sancho’s potential move to Old Trafford, wherein the decorated centre-back explains why the promising forward would be well worth the pursuit. “I would take him [at United] all day,” Ferdinand stated. “English, young, hungry and talented, that’s all I need to know. I have known Jadon since he was a kid, knew him through friends. I have known his family since he was a kid, before he was even born. “He has got the mentality. The mentality is a big part of it all, whether he has the physical attributes or not. The kid’s mentality, to leave Manchester City, who wanted him to stay, to just say ‘My ability deserves it and I think I can do it straight away, right now. I am not waiting’.